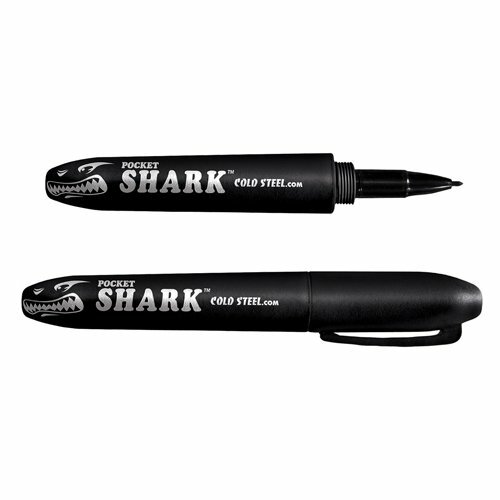 The Sharkie is a tactical pen manufactured by Cold Steel. At a casual glance, it seems to bear a strong resemblance to a standard felt-tip marker, including the lettering which looks just like “Sharpie” with a single letter changed. The well-known black and white design also look just like a Sharpie, and only a close observer would notice the difference. Customer reviews say it writes just as well as the pen it so closely resembles, if not better. Like the Sharpie, the Cold Steel Sharkie is a good, serviceable pen with a bold, legible line and a beautiful, extensive body for comfortable gripping. The walls are four times as thick as those in a regular marker, giving it the strength to stand a percussion blow. The material is not regular plastic, but glass-reinforced Grivory. Both the body and tip are designed to withstand repeated impacts without shattering or popping off. The point is stable and narrow enough to inflict deep, painful wounds in an attacker. Martial arts experts have compared the Cold Steel Sharkie to the kubaton or the Yawara stick in its effectiveness as a weapon. Even if its user never has to face mortal combat, the Cold Steel Sharkie’s durability makes it one of the best pens on the market. The same strength that makes it an excellent weapon also ensures that it can withstand years of hard use and abuse. If something substantial is accidentally placed on it, the Sharkie will survive and keep writing. If it gets dropped from a height, stepped on, slammed in a door or suffers any other workplace accident, chances are the Sharkie will live to write another day. Those who are prone to such accidents can take heart: This is one pen that can take it. However, the manufacturer’s claim that the Sharkie is “indestructible” is a slight exaggeration. Customer reviews include occasional accounts of Sharkies breaking in two in the middle from strong impacts into concrete. Of course, human flesh is much softer than concrete, and while the claim is not strictly accurate, it is true that the Sharkie will stand up to any impact it would probably suffer in a fight. Prices for Cold Steel Sharkies vary, with some sites asking as much as $10 US. However, a little shopping can turn up Sharkies for $8.50 or $7.00, and occasionally as little as $4.00.